This is the most abused four-letter word in the English dictionary. Quite rarely do we mean ‘love’ when we say it. A young teenager who lusts for a girl says he loves her. A woman who has been forcefully married to a man says she loves her husband. A son whose father abuses him day and night says he loves his father. A boss says he loves his employees. A politician says he loves his people. But do they really mean what they say? The truth is — we have forgotten what love really means. Pure, undiluted love is becoming increasingly rare to find. We know but we are scared to admit that the word ‘love’ has become a mere label to describe many relationships that we cannot free ourselves from. These stories aren’t easy to read. You need to keep your rosy-tinted glasses of romance aside to be able to digest them. These are about love in its bleakest form. These aren’t stories of people who are bound by love; these are stories of people who are Bound In Love. I have a confession–I have never given short stories much importance in comparison to novels. But slowly and steadily I am falling in love with this format of story telling. 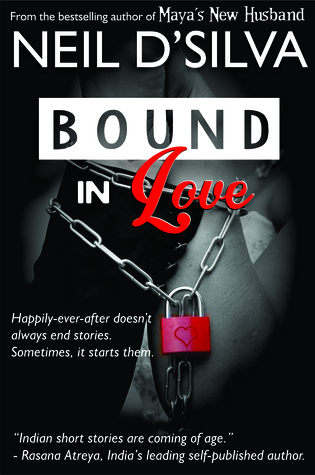 ‘Bound In love’ is a major contributing factor to my rising interest in short stories. The stories in this collection are bound by a single theme, but each one of them has an identity of their own. Neil D’Silva has done immense justice to all in terms of their distinctive setting and subject, which includes—human relations, workplace, profession, religion, as well as era. Each of the story is like a single, precious pearl bound with the string of love. The collection boasts of mother’s love for her son, a colleagues excessive attachment, a wife’s love for her husband; be it they are slum dwellers or rulers of a kingdom, as well as pure selfless love. Neil D’Silva has covered the complete spectrum of love and its consequences; starting from affection, adulation, fear, to obsession. If I have to choose which one I liked, I would list all of them. But still my personal favorites were ‘No Chocolate For you’, ‘No Greater Charm’, ‘At The Next Stop’, ‘A Song Without Music’, ‘New Wine, Old Bottle’, and ‘The Makeover’. Mr. D’Silva is a master storyteller with firm grip over myriad human emotions. All the stories are narrated such that the settings came alive in front of my eyes. He made me think and marvel over each of the stories and the picture it invoked in my mind. I highly recommend ‘Bound In Love’ for people looking for high entertainment quotient as well as getting a peek into infinite complexities of human relations. Neil D’Silva is an author of three books. His first book, MAYA’S NEW HUSBAND, published by Authors’ Ink Publications, has been an Amazon India bestseller in the horror genre for several weeks after its release. This book was also the winner of the Literary Awards 2015 in The Entertainer category. His second book was THE EVIL EYE AND THE CHARM, which was a short-story collection about Indian superstitions. His third book, BOUND IN LOVE, which is his latest release, is a collection of seven short stories based on twisted human relationships. Apart from that, Neil D’Silva is poised to be a part of two anthologies this year – one with WriMo India and another with Readomania. He is also a blogger and promoter of Indian literature. He is the founder and admin of the Facebook group of writers named For Writers, By Authors, which has reached 6000 members in just 7 months. He mentors people to write and bring their work in the public eye. Other than his writing career, Neil D’Silva has been a teacher for 20 years, having taught English, Mathematics, and Science at his Mumbai-based coaching institute, Disha Educentre. He is also the co-founder of the online editing and writing services company Pen Paper Coffee.